Picking and eating crabs is an earthy, down-home way to enjoy these tasty crustaceans. Crabs don't give up their treasures lightly. Picking crab meat takes time, but it's pretty easy when you know how it's done. First, prepare a large workspace. Lay down newspaper because you're going to get messy. Pickin' crabs is not dainty. Use a bowl for your cooked crabs, a bowl for good shells (you can use these to make stocks and sauces), and a bowl for the pure meat. It's best to have an easy to access and open trashcan nearby. You may also want to have nutcrackers, wooden mallets, and lots of paper towels on hand. Start by removing all the legs and claws first. Do this by grabbing the very base of each leg and pulling it away. Set the legs aside for later. If you turn a crab over, you'll notice a plate on the bottom. A narrow, pointy plate means it's a male crab (a "jimmy" in East Coast terms). Female crabs, called "sooks" in the East, have wide, triangular plates. Slip your finger under the plate and peel it back. Grab the base and pull the whole thing away. Now it's time to open the body. Wedge your thumbs on opposite sides of the body, then pull the top of the crab away from the bottom and brace yourself; there will be all sorts of icky-looking stuff in there. The crab's lungs appear as feathery cones lining the side of the body. Remove them and throw them away. An old wives' tale says crab lungs are toxic, but they're actually just not digestible and taste terrible. Now scrape out the gooey stuff in the center of the crab's body's two equal solid parts. The greenish stuff is the liver, called the tomalley. You can eat it and many love this part of the crab. If you have a female crab and you see bright orange stuff inside, that is edible. It's the roe or eggs, also called "coral" in shellfish. Coral is delicious when it's warmed and served on toast or used in crab cakes. You can also add it to crab soups; it's the key ingredient in she-crab soup. 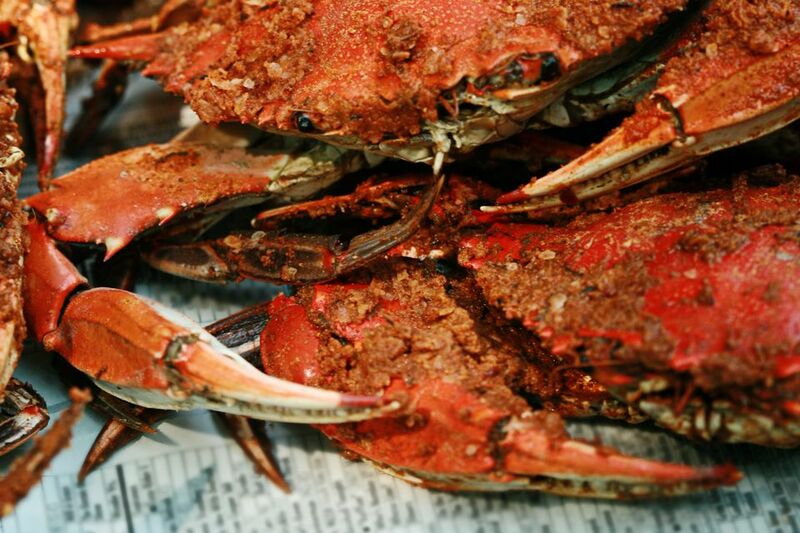 There's a lot of good meat in the body of most crabs, especially blue and Dungeness crabs. It's located in cartilage-lined channels in each of the two equal sides of the body. Grasp each side and break the body in half to get to it. Now you'll pick out the meat from this maze of cartilaginous channels. It can be daunting at first but don't get discouraged. You'll learn how to navigate this maze and the picking will go much faster after a few efforts. You might only want to bother with this part if you have Dungeness, blue crabs, or any other crab with a top shell that's wider than 5 1/2 inches. The bodies of smaller crabs are tasty, but you'll do a lot of work for just a little meat. Add the bodies of smaller crabs into stocks and sauces instead to get that sweet crab flavor. Start with the legs and claws by pulling the lower part of each claw off. This often pulls all the inner claw meat with it, but it'll be attached to a hard, cartilaginous fin-shaped thing in the center. Just pinch the meat at the base of the claw and pull it away from the cartilage. The meat inside the legs can best be extracted by breaking the joints backward. Just like with the claws, the meat will usually remain attached to a thin piece of cartilage. Just slip the meat from this cartilage. Again, you might only want to bother with this if you have large crabs. Finish your crab by cracking the hard-shelled claws and knuckles. Some people like the knuckle meat the best since it has exceptional flavor. Use just enough pressure to crack the claw. Gently increase pressure until the claw is cracked, then pick away the shell and extract the meat. If you crush it too forcefully, you'll mash the meat and bits of the shell will grind into it. If all this sounds like a lot of work, don't worry. You'll be able to pick a crab in just a few minutes once you get the hang of it.